WRITTEN BY SIMON AUSTIN — JULY 28, 2017 – originally published on The Training Ground Guru. As things stand, 38 Chelsea players will be on loan at the start of the 2018/19 season. 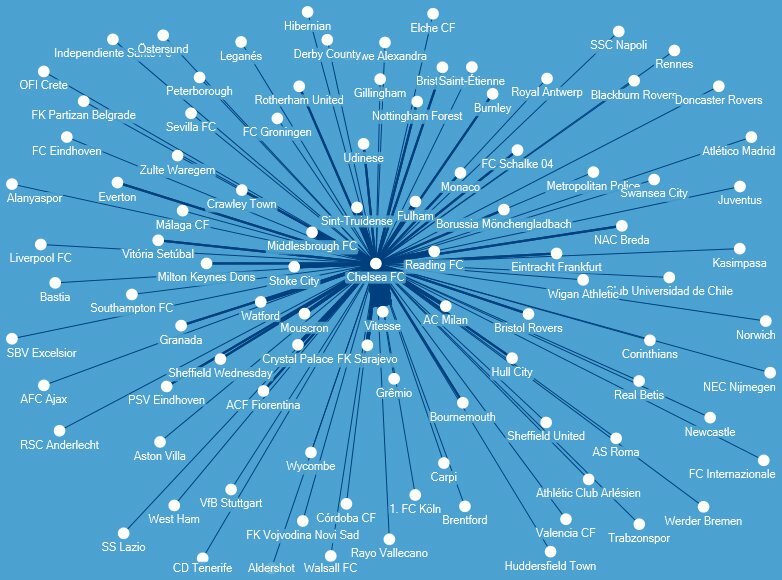 The above ‘ego network’ shows the destinations of Chelsea players during the last five seasons – starting in 2013/14 through to the upcoming season. It was produced by Dr Paul Widdop of Leeds Beckett University and Dr Dan Parnell of Manchester Metropolitan University. The teams closest to the centre received the most players on loan.